Our training program is based on the circular notion of ongoing training, in contrast to a linear progression of training years. A trainee can enter our training program at any particular Training Year being offered, and then proceed through all four years in order to complete the training program. It is not important to begin the training in any particular training year, as it does not progress in a 1-2-3-4 fashion. It is only important that all four years are completed in order to receive a completion certificate from our Training Program. For example, this year we have new trainees entering a training year which focuses on the Fires of Transformation theme and empowerment dynamics. 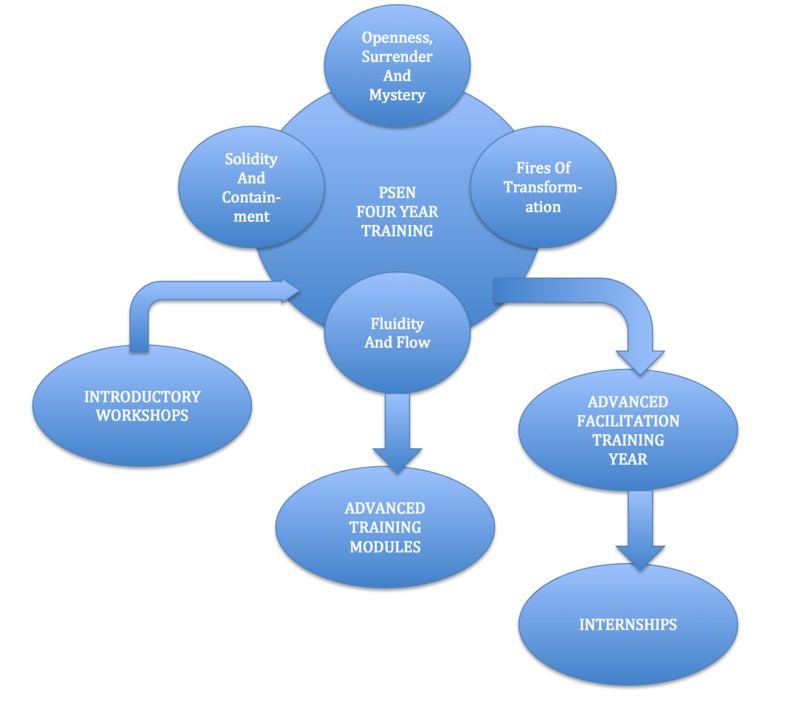 A trainee entering the training at this point would advance through their training by next entering the training for Openness, Surrender and Mystery in the following year, then proceed to the next two training years after that. This allows our training groups to have both a solid foundation of ongoing trainees, while also allowing a new influx of energy and learning opportunities to refresh the training group each year. We see this as a healthy and more fluid alternative to older, linear and hierarchically structured learning environments, which can sometimes inhibit trainees. A circular model is also more congruent with our teaching styles, methods and philosophies, which encourage a more exploratory and open way at arriving at self discovery, insight, paradigm shifts and transformations. Considering the complexity of modern life, especially in the West, we have come to believe that meaningful depth work needs to include both the psychological rigors of deeper process work, as well as an exploration of the mysteries of one’s own soul descents and spiritual expansions. It is also our belief that inner work must encompass and embrace all aspects of human life, both the mundane as well as the spiritual ones. Many of us have been immersed in spiritual journeys for years, and perhaps still struggling with the issues of daily life. Many of us have embarked on a transformational journey with the help of psychotherapy, yet we still feel a deep need for an experience of the transcendent, that which is beyond this world. We have worked for many years to develop a comprehensive approach that addresses development issues related to the concerns of the ego, as well as spiritual perspectives that help us to surrender our ego states, once we have cultivated a healthy relationship with them. In this section, you will find the design each training day, which follow a consistent format that we use for each of our training weeks. It is intended to give you a broad sample of what to expect in our training programs over a four year time span.